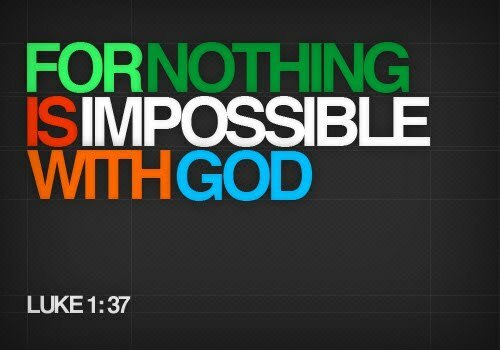 Nothing is really impossible with GOD if we will only trust Him and let Him lead our path. Most of the girls love accessories, for some its already a staple of their everyday outfit. Like most women, I love to wear at least a piece - a simple yet elegant will really complete your outfit. I've seen this bracelet on some fashion sites and eyeing this to have until I came across to an article about the bracelet itself. I found out that I'm not qualified buyer? Let's find out why and check if you're qualified or not as well. For sure you've noticed many celebrities are already wearing this, because aside from its simplicity and elegance this jewelry is also a symbol of chastity. Cartier love jewelry collection includes ring as well. 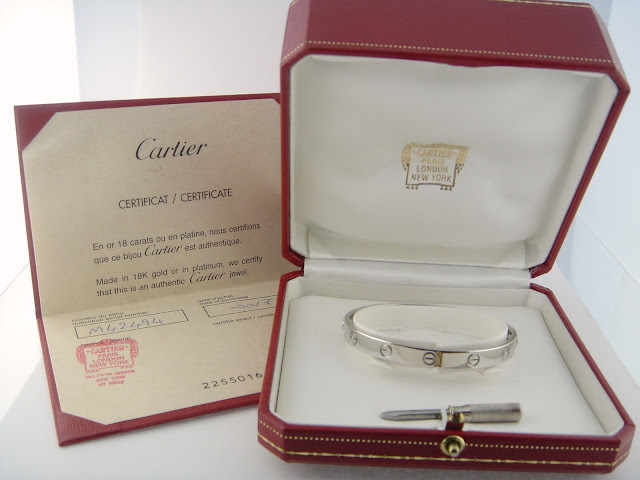 The story about the Cartier love bracelets goes back to 1969 when late Aldo Cipullo created the Cartier chastity bracelet as his very own interpretation of chastity belt. I see so may chastity belt pala talaga ang alam ko lang kasi chastity ring, meron din palang belt. It was believed that chastity belt was a device where husband locked around their wives' waist to ensure fidelity while they are away. The bracelet locks around the wrist and comes with a tiny screwdriver. The locking of the bracelet symbolizes eternal love, and once the bracelet goes around the wrist it isn't easily remove, and the only way to remove it is through the screwdriver. O di ba, mas matindi pa sya sa wedding ring na bato bato sa langit yung iba kapag nakatalikod na ang asawa hala tinatanggal na, tsk tsk tsk. Isn't it a great idea if instead of ring, love bracelet na lang? Like any other jewelry brand Cartier issued a policy on selling their love bracelet. Would you believe that not all even you have money can buy this? Yup unless otherwise your partner will buy it for you. No customer can purchase the Cartier love bracelet for themselves. Do you think what's the reason of Cartier? So for you ladies you need to drop off some hints to your man to buy for you and or vice versa. Since last week we're passing tough times, but despite of all the things we're going through we are so much thankful to the Lord, He never let us down. Truly He is our hope and refuge, His ways are really amazing and all things are really possible to Him. The entire week is really hard but everyday bring us lessons in life. One of our cousin here in Doha was admitted to the hospital and its not like any ordinary fever or minor operation that will last only for weeks or a month to heal. Due to some complications there are some procedures that was done He stayed in the hospital for almost a week and undergone several tests. "Bawal magkasakit" that is the common motto you'll heard if you're working here in abroad. Actually not really because of the hospital bills or any medication related issues, as long as you have your health card naman the bill is not as expensive compare to hospitals in Philippines. It's difficult in a way that you can't work of course and you have only few people or sometimes none to be with you in the hospital. Even you have some relatives or family here not all the time they can be with you as they need to work as well, ang hirap talaga unlike sa Pinas na anytime you can file leave of absent, sometimes one day absent pa lang big deal na sa company. Its good thing its Ramadan, some of my cousins are dismissed from work earlier than the usual, so after work they go to the hospital and stay there. And since our Ramadan timings are just like the usual office hours, after 7pm or 8pm pa ako nakakapunta sa hospital. Thanks to our driver for being supportive in dropping me there. Just the same week I found out that my hypotension was back again, and now I'm back in taking vitamins and some fruits to help me gain my blood pressure to normal. Because of that also I need to have complete sleep hours. Thanks to my cousins Ate Che and Leslie for taking so much care and sacrifices being with Kuya in the hospital, rotation sila sa pagtulog sa hospital and sometimes walang tulog talaga then they still need to go to work. Thanks to Ate Rachelle too for guiding and supporting us especially among us sya lang ang medical practitioner, to Jep and Josephine for spending time in the hospital instead on a date, to Aldous for even we know na nakakapagod din talaga ang magdrive at puyat ka, you never say "no" to us, to Eiyah na kahit pagod ka instead na itutulog mo na lang nagbantay ka pa rin kay kuya, to Tita Sylvia and Tito Abet kahit wala po kayo, really prayer works, to Peach thanks :-) and to Baby Red for putting smiles on our face kahit pagod na kami, thanks Baby!. Kapit bisig talaga ang labanan. There are so many issues aside from that, and we only have each other. Ang hirap pala talaga na walang matanda, I mean yung nagmamatanda - our aunt and uncle are in the Philippines for their vacation kaya talagang wala kaming choice kungdi kami ang gumalaw at magsupport sa isa't isa. Almost every hour or less we communicate and even our families in the Philippines. Thanks to the technology, its easier and of course no cost at all to keep updated. Family will always be your family. God put you to be in one family because He has plans for each other. Sabi ko nga lagi walang perpektong pamilya, all we need to do is open our heart bigger than our eyes. Minsan may tampuhan, away or samaan ng loob but in times of problems pamilya pa rin ang magiging takbuhan natin. And if ikaw ang hinihingan ng tulong magdadamot ka ba? isipin mo na lang kung hindi pamilya ang tutulong sino pa? If there's one lesson in life that I'm really feed my mind and my heart its empathy. Lagi kong iniisip what if ako yung nasa kalagayan nya, what if sa akin nangyari yon, may tutulong kaya sa akin. Sabi nga kelangan ang good deeds ipinapasa sa iba, ikinakalat. Isipin mo na lang kung tinulungan mo sya ngayon for sure hindi man nya maibalik sa'yo sa ibang nangangailangan nya ito ibabalik. 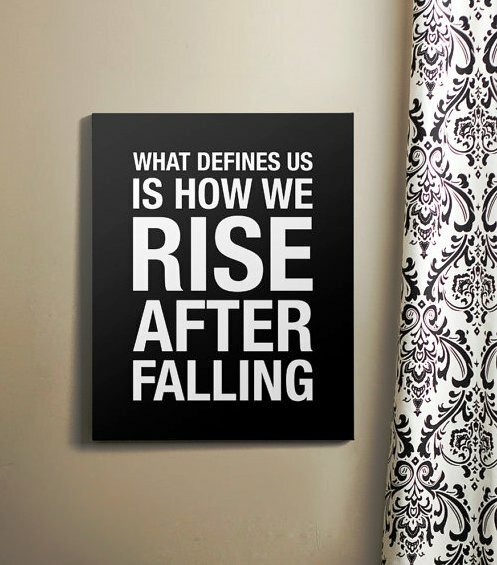 Tough times are not the time to give up. Uplift one another by thinking of the possible solutions to overcome the situations, to encourage one another and not to discourage. Its not the time to point out who's to blame. Support one another. There are many ways in supporting each other, sometimes even the simplest message can help to ease the burden, to assure that you are behind and ready to help even in the simplest little thing you know. Prayer is the best weapon to fight any kind of battle. Always remember that everything happens for a reason. God's ways are not ours. He knows what's the best for us and all we need is to trust and continue to hold unto Him. I received some revelations from the Lord as we experienced tough times, and I'm super thankful talaga. I know that the storm is not yet over and ngayon pa lang I lift up and commit everything to the Lord. He has better reasons than us, and all we need to do is to walk continuously until we end up to finish line. 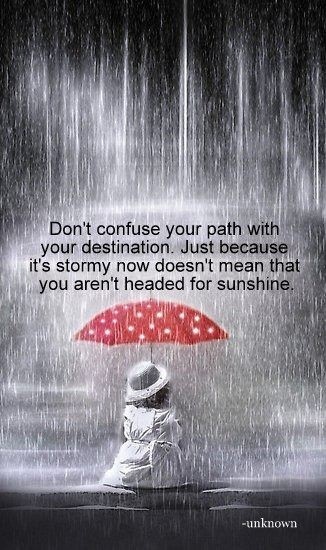 There's always a rainbow after the rain, we know that each of us has its own lesson learned. And whatever God's reason for all of these, we claimed that its all for our own good. Wala namang ibibigay si Lord na di natin makakayanan di ba. As Romans 8:28 says "And we know that in all things God works for the good of those who love Him, who has been called according to His purpose"
Today is a start of a new week. Every woman has its own favorite accessories out of her box but sometimes no matter how many and how fashionable they are it doesn't look attractive when you wear it. 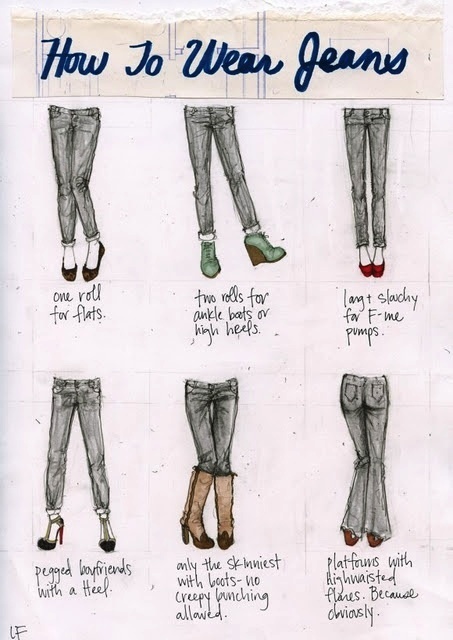 So here are some infographics to help you and me on how to wear right staples on a certain outfit. 1. Buy a classic piece, classic in the sense that you can wear it flexibly no matter how formal or casual your outfit. If you doesn't have pearl necklace yet I suggest you to have, its the most timeless piece a woman can have. Second woman's best friend of course diamond is the first on line. You can wear it weather your in dress, jeans or even on your summer get up. 2. Use bold necklace for a simple and plain top, but use the simplest you have for printed top. 3. Be sure not to over accessorize. If you are wearing dangling or chandelier earrings do not use bold necklace, sometimes it would be better not to wear necklace and stick only to a fab earrings. 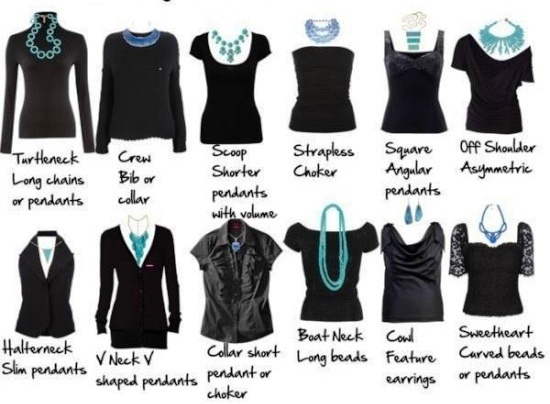 Don't be a dress victim on your next party, if you don't have an idea yet on which cut will best fit on you, check this. These are only simple and basic guidelines but essential. 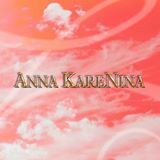 Its important to know which one will be best suited to us, it will really help us to look more beautiful, and feel good. And girls, the more we are aware to which one will be best fitted to us the more we can save. So don't be a messy dressy woman, just be informed and aware and for sure you'll be gorgeous. Every year I'm one of those million Filipinos who are waiting for the State of the Nation Address. I have only two reasons: what the President will say and who will be the best on the red carpet. 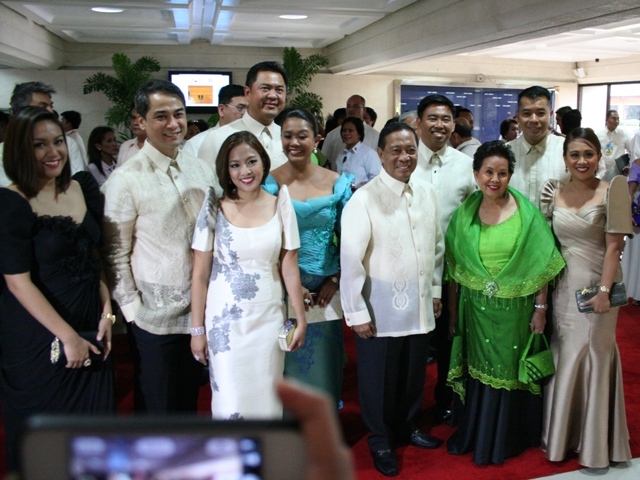 Before of the SONA at Batasang Pambansa, Senators opened the first senate session yesterday, notice that some of them change outfit pa talaga before heading to SONA. 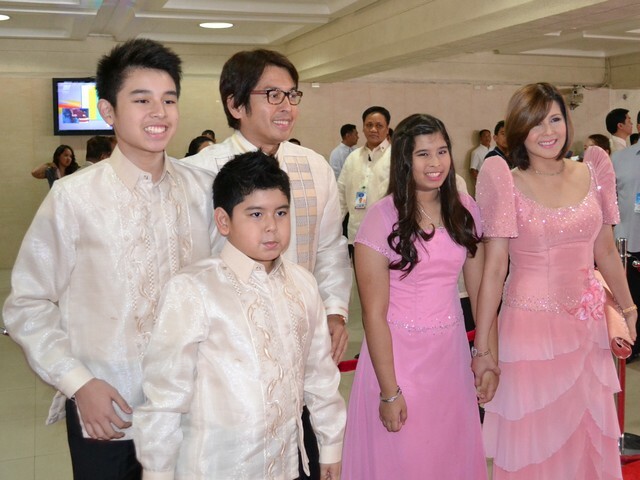 Let's take a glimpse on the red carpet of the Batasang Pambansa. In every event especially in a red carpet there's always a best dressed and worst, but I chose only those that captured my attention. "Oscars of the Philippine Politics" this is how JC Buendia, designer, describes the red carpet on the President annual State of the Nation Address. SONA is one of the few event that we as an ordinary citizen can see other family members of the officials that we voted, of course Aquino Family is known by everyone already. 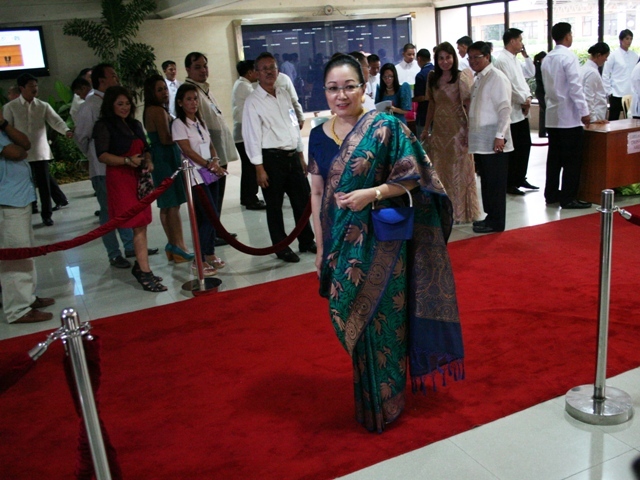 SONA give way also for politicians and government officials to walk in the red carpet with their spouse. Every SONA, expect number of outfits made from indigenous fabric pinya nd designs that highlight the ethnic Filipino heritage. 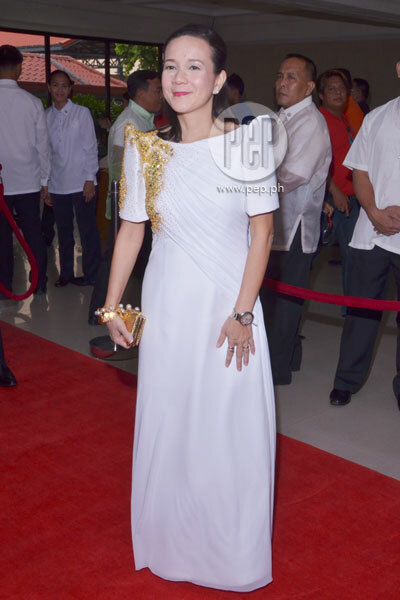 Symbolic outfits and Filipiniana is on trends as well but nothing beats simplicity. 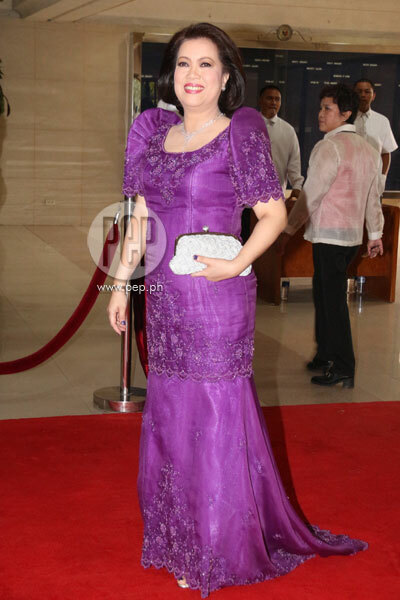 According to CJ Sereno, she chose color purple as this color is the color of the judiciary. As per Coun. 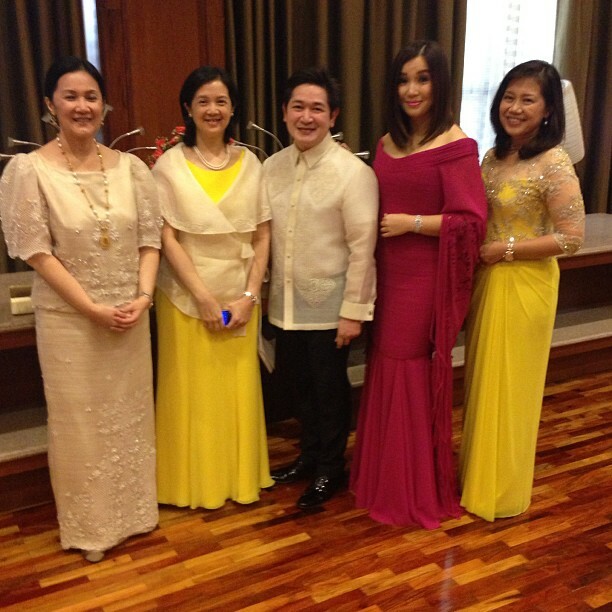 Charee she just chose yellow to still look young at age of 23 in Filipiniana. But ooopsss how about one of the "sexiest" dressed. Well she was able to carry herself naman, kaya lang sana next time not that bare, its SONA not Film fest naman. 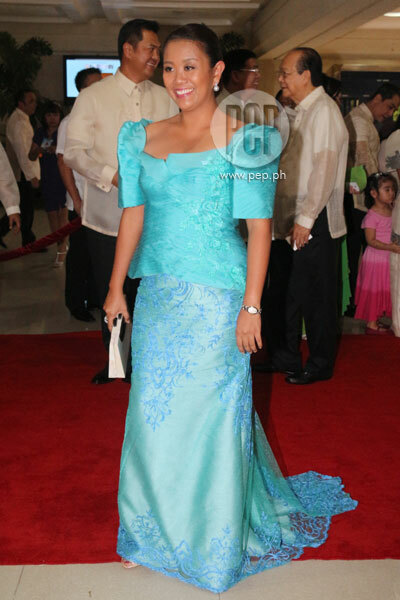 Senator Pia wore a bare back gown also last 2012 SONA, so kaabang-abang every year let just find out next SONA if she will wear the same. Simple, magarbo man or agaw attention man sila sa red carpet its their performance on the government that matters, servant of the people and not a "highness"
I had a great weekend. 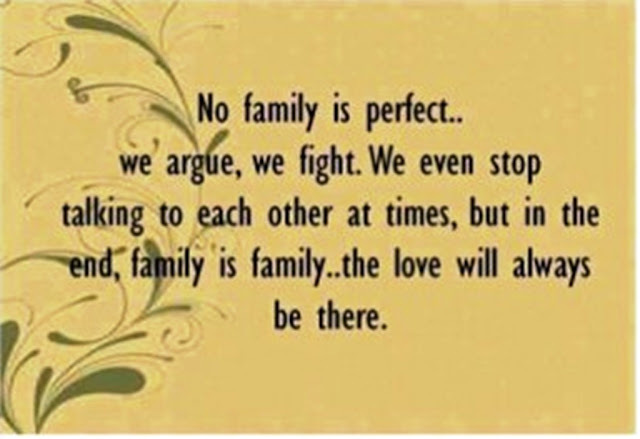 And its all about family. I started on Thursday night, a welcome home pizza night for Baby Red :-) I'll make separate post to introduce you guys who is she. But for now let me just give you some reviews to films I watched. Ever since I saw the trailer of the movie I think two months ago, I know it will be another hit. The movie is the 20th Anniversary presentation of Star Cinema, and no wonder on its cast. 1. There's no perfect family. 2. Each siblings are different from each other, sabi nga kung 10 kayong magkakapatid may 10 traits na iba't iba rin. There will be rivalry, competition, tampuhan but the end of the day family pa rin. They are your number supporters, they are your safety net when you fall. People in our lives will come and go but believe me family will always stay with you no matter what. 3. Don't judge people. Sometimes we easily judging people without even notice na naiinggit na pala tayo. Sometimes kapag may mga tao sa paligid natin na nakakaanggat sa atin instead na matuwa tayo for them, pilit at pilit tayong hahanap ng mali on them hanggang ipahamak na tayo ng doubt natin sa kanila. 4. Forgive, accept, love and respect each other. God chose each other to be a part of our family, hindi dahil black sheep or tambay or hindi achiever is wala ng kwenta. Each member of the family has its own role for each other, to mold and to be the best of each other. 5. Favoritism among children really affects. I am not a parent yet but I guess its hard sometimes for parents not to have favorite especially if the family is big. But remember Mommy and Daddy having favorite may lead to have disunity, jealousy and envy within the family. So parents must really draw close to God, ask wisdom on how to raise their children in Godly way. Each person is unique as each sibling is different from each other they have their own strength and weakness and they are special in their own way. 6. Working hard for family is really all worth it. I guess that's one the best trait of Filipinos being a family oriented and our strong family ties. Sometimes we experiencing to sacrifice even our own dreams and happiness for our family to have their own. But no matter how difficult we've been through, at the end its all paid off by a sweet gestures and assurance that they are happy. I suggest to you to watch it, it will not only make you laugh and cry but its really a story a meaningful story. A story of forgiveness and acceptance, relationships, family ties and unconditional love. At last I was able to watched it! I heard this movie from my cousin, this is one of her favorite movie and after watching it I think it will be on my favorites list as well. 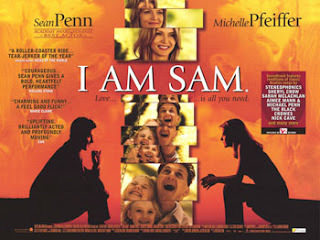 I am Sam is a story of a mentally retarded (due to Autism) man who fights for his 7 years old daughter and in the process teaches his cold hearted lawyer to be to value of love and family. It was shown 2001 but the story is really classic. Kung sa Four sisters ay cryaola ako dito super crayola talaga. I can't help to imagine how many normal parents just left their children and abandoned their children because they are afraid to accept the responsibility. 1. Love is all you need to be a parent, to be a father in Lucy's case. Its not the diploma or the IQ of a person that can fulfill the love and care that a child is longing. 2. Finding the real you and accepting who you are. Learning to love who you are and letting others love you for who you are. Sometimes we have so many insecurities, but look at the people around you, why they are happy, contented and fulfilled in life despite of disabilities or lack of material things in life. Its because they learned to accept and love themselves. 3. We learned from each person we meet. Don't think that because a person is not as brilliant as you, he can't impart anything to you. Lessons in life are mostly acquired not through learning but through experiences that we encounter. As I checked other reviews for this film, I found out that this is included to the top 10 films on the bucket list. I am pretty sure guys you'll love the film too, you'll appreciate more your parents and even people that surrounds you. Family is one of the best blessing a person can have. Love and value one another, in the end they are the one that we can only have when the world walk out. And since its Thursday magreminisce tayo! I was in highschool then, pipilitin talagang makauwi ng 4:30p.m. para makaabot sa ANG TV! 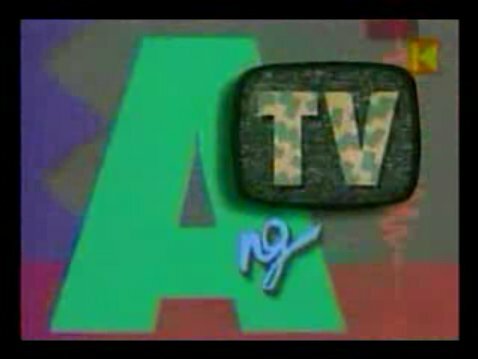 ANG TV is a youth oriented variety show directed by Johnny Manahan. Many of the Philippine artists are from the show like Angelica Panganiban, Claudine Barreto, Rica Peralejo, John Pratts, Kaye Abad, Jolina Magdangal, and Patrick Garcia. Kapag 4:30 na?! ANG TV na!!! This I guess is the long running soap opera, elementary pa lang ako napapanood ko na naghighschool na ako hindi pa rin alam ni Amante na ang anak nya ay si Mara, sa galing magtago ng sikreto ni Garry buti na lang anjan si Tiyo Kardo na may alam ng lihim at salamat sa diary in the end nalaman din ang sikreto na si Clara pala ang anak ni Susan at Garry while Mara is the daughter of Almira and Amante. Kilala mo ba si Kuya Bojie? e si Pong Pagong at si Nining? e alam mo ba ang sinasabi ng bolang bilog na hindi natutulog? Trivia: Did you know that the first name given to the show is "Sesame" ? 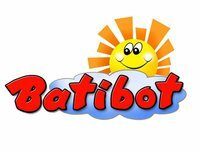 "Batibot" means small but strong was first aired in 1984, they are using English and Filipino language but became completely used Tagalog. Saturday is a Gimik day! This is a teen oriented show consisted of Star Magic Talents. Mga ka-generation naalala nyo pa ba ang mga name nila? 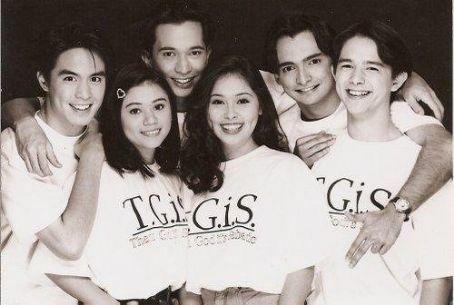 Judy Ann as Dianne, Rico Yan as Ricky, Patrick as Carlo, G.Toengi as Gina, Jolina as SC, Diether as Gary, Bojo Molina as Brian, Mylene as Melanie, Marvin Agustin as Joey, Diego Castro as Jigs. My favorite team is Melanie and Brian samahan mo pa ng masarap ng coffee ni Melanie :-) nursing student from the province, matured magisip, responsible, matalino pero takot sa commitment. So many kwento about Gimik! I really love the story of the show, hindi lang sya for youth but even for the whole family kasi they tackle realities about the relationship of each family. Hoping ABS CBN will create a new Gimik like show. "Dear Joe" aired in ABC 5 once a week, if I'm not mistaken every Tuesday night. Parang a.k.a Charo Santos lang the difference nga lang Love Notes from its title are love stories. I have one episode na until now I can still remember the plot, its a New Year episode, hindi ko na idedetalye but the story is all about "don't take people for granted, if you have time now to say and let him/her/them that you love them they say it and show it. 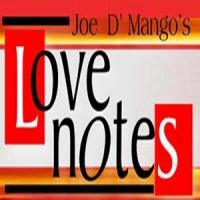 I think there's still Love Notes pero sa radio na nga lang yata wala na syang tv shows. There are a lot of tv shows that has been part of everyone's lifestyle and set a legacy to our generation. How I wish tv networks will create and produce again the same tv shows like before - I mean yung mga realistic shows na kakapulutan ng aral, yung mga tv shows na hindi anime or kathang isip lang ang nanalo sa labanan, some stories about life, and how to walk with life sana. Ang afternoon love story subay-bayan ni Mr. Kupido at ng F.L.A.M.E.S., kinilig at inabangan mo rin di ba? Ang OKI DOK KI DOC ni Doc Aga at ang OKA TOKAT ni Agot Isidro. If you're from my generation for sure mapapangiti ka habang nire-recall mo ang mga tv shows na ito, pero kung hindi man kita ka-generation, try mo rin magpost ng galing sa era mo :-) I-throwback Thursday mo na rin yan! Not all the time we have same energy as previous days. Sometimes we feel weak, sad or lousy but after realizing why, sometimes we ended up with no reasons, did you ever experienced that? Hindi mo alam kung due to hormones ba ito or dala ng mainit or pabago-bagong weather basta all of a sudden you change your moods. This week I felt that my energy go down, I feel drained and tired most of the time. And hope it just only because of the not so good weather here or lack of sleep since Saturday. Nevertheless, there still some positive and beautiful thoughts, instances and even people along my way - its all blessings, they are all blessings. Let me share you some of thoughts that help me boosts for past few days, who knows it will help you too. Nobody is perfect, everyone have flaws, commits mistakes, and feels heartaches. Well, if you don't agree maybe you're just a numb. But how are you after those heartaches? after the trials, after tons of problems? 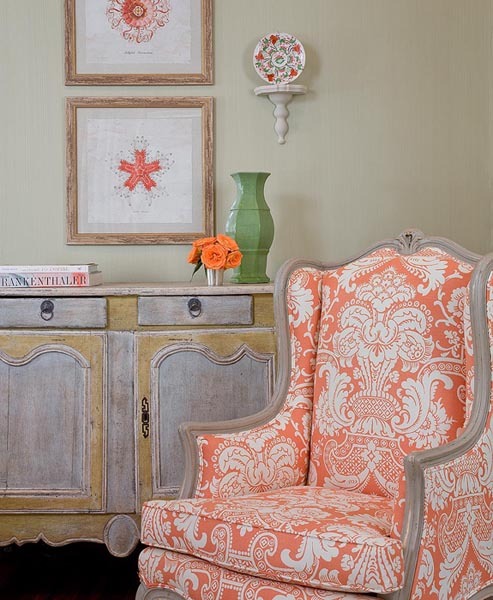 a statement wall art I found on one site I browsed to check frames for wall decor. 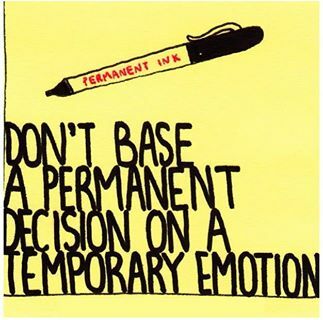 Emotion is temporary, its not constant, pabago-bago lang. What you feel right this moment for sure its different from what you felt yesterday. There are still so many people who are relying "only" or most of the time on their emotions. I'm not saying that we just ignore our emotions, NO, what I'm trying to say is we must balance and try to set standard in deciding over things not purely emotions. Hindi ka naman magpapakasal lang dahil sa mahal mo "lang" sya. Hindi ka naman nagdesisyon lang na yung feelings mo lang ang pinagbasehan mo right? kasi hindi mo naman alam kung bukas makalawa you still have the same feeling, sabi nga ng matatanda maiipakain mo ba ang pagmamahal lang. Everything happens for a purpose, we may not know it now but in time we will able to realize that its all for us - for our very own good, kaya instead of praying na tumigil na ang ulan, pray for strength to overcome the storms. And remember guys there's always a rainbow after the rain. Don't loose hope! 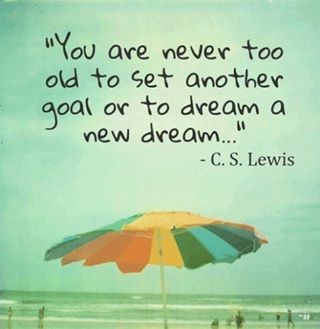 as long you are breathing you still have a million hopes and chances to fulfill your dreams. But hope is not the only thing, of course you must work for it. So go go go!!! Everyday may not be as good as we expect but every day there's always something good. 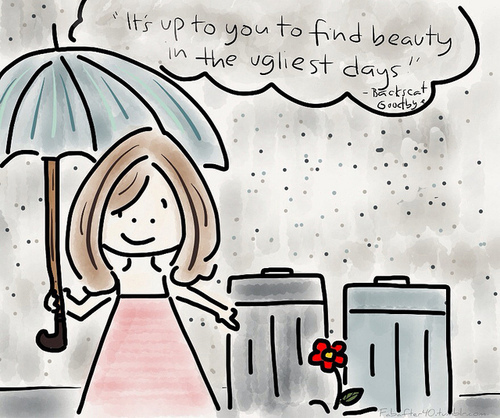 Its up to you how will look things - will you ruin your day because of something or someone or will you create things that will make your day even brighter and colorful as you want? Sometimes we need someone to cheer up and to encourage us but if there's no one to give you a hand, don't think that they doesn't care for you. Be positive and help yourself to make everything fine. And not to forget the most powerful among those encouragement quotes PRAYER and the BIBLE. When was the last time you open your Bible, when was the last time you feed yourself of Word of God? Sorry guys wasn't able to post anything for this weekend. I'm getting lazy lately, even I have few on drafts I can't continue or I don't know how to end. Did I tell you that I love furniture, home decor and even interior or just anything about house - living room, kitchen, dining, rooms, any part of the house. And here are some of my picks that if I 'll have a chance to incorporate on my own house or room, I will definitely give it a try. 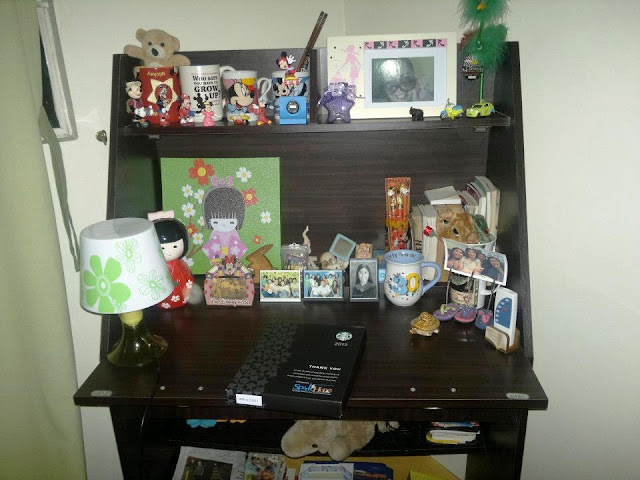 That's one of the thing that makes me so excited to go back home, I miss everything on our house and on my crib - my room. I'm not a "sunny" person, literally my eyes cannot stand the direct natural light maybe because it really triggers my migraine, that's why curtain is essential in my room. 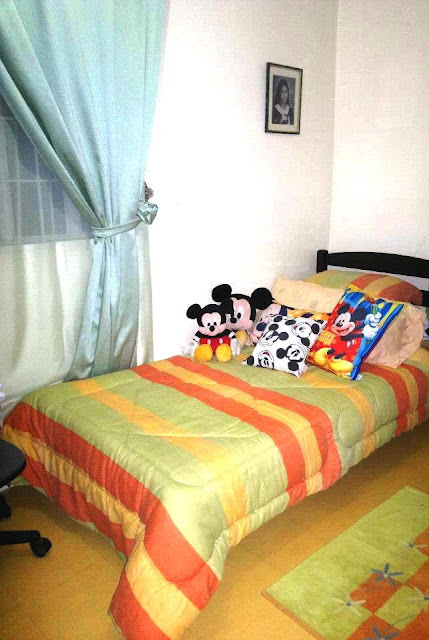 Even I'm away from home for some years, Mommy always assures me that she personally taking care of it :-) - clean it, change the bed sheets and curtains and check my stuffs. I want to change the curtain style that I'm using in my room. I'm using the traditional double curtain, kapag morning nakaopen sya sheer curtain lang ang naiiwan then sa gabi totally nakababa yung first layer ng curtain. 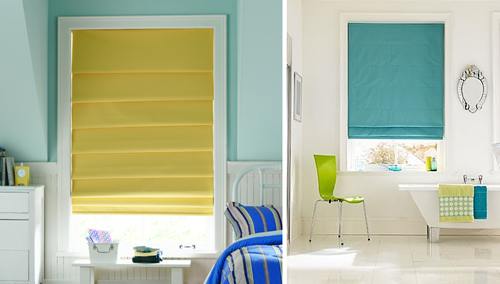 So I'm just thinking to have roman curtain, na mas madali, its almost the same as blinds but you can have it in a fabric. Yun nga lang you can't buy it ready made like other curtains kailangan talaga na masukatan yung window para sure na tama yung sukat. I asked Mommy na humanap ng magtatahi, I 'll definitely choose neutral color so bagay pa rin kahit anong color ng bed sheets. Since mejo spacious pa naman ang room ko kasi mu bed is single naman, siguro ok na yung ganitong working area sa loob ng room. 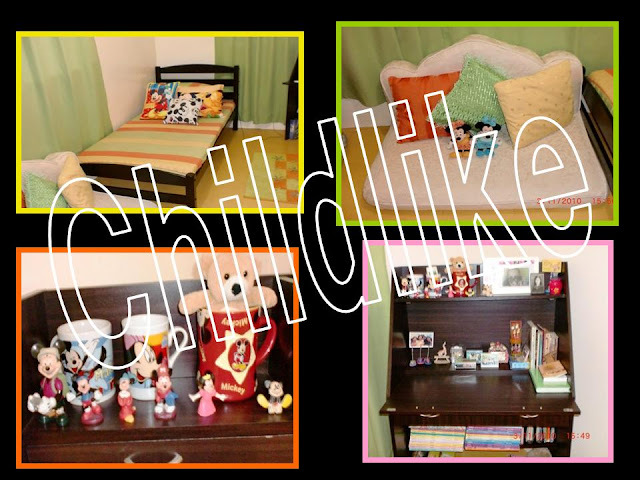 I'm excited to re-decorate my room, to change its interiors - dagdag bawas na naman ang peg ng pag-aayos. I am a sentimental person kasi so sometimes its hard for me to let go stuffs from people I really love and treasure but as they say sometimes we need to let go things and just recall the moments and memories. I'll update you as soon as magawa ko na. So guys if you know where I can buy low cost home/ room decor and stuffs or even furniture just let me know. Remember its still the "home" that matters. May our house be filled with love and care from each other so it will always be a home. Open Letter to a "Girl"